Utterly amazing. I cannot comprehend the craftsmanship involved in the creation of this healing mace. I think this is a drop from Illidan, considering the Karabor thing, and the fact that this is one of the greatest items in-game. Ilvl 151 on these one, which means loots from Illidan or Archimonde, it could be a quest reward but if it was, it wouldn't have any level requirement. So which guild got this and which class did they give it to? When casting a flash heal (1.5 second cast) on a target under 50% health, this mace effectively has +400 healing. Talk about an amazing healing item. When making the image that I submitted, the model for the file was labelled under Hyjal, my assumption would be Archimonde as only one guild has killed Illidan so far. I think at least two have killed him by now. I'm having trouble seeing the math on that, can someone explain? Edit: Nm, just re-read that on equip effect and realized that it adds a flat 180-220 health / heal, regardless of the heals cast time. Probably the best healing weapon currently in the game considering the +healing and the additional 180-220 is nice too. If you start your cast...say, holy light... and the tank is at 75%, and he drops below 50% during your cast, would the extra healing take effect on that cast? I suspect no. Well seeing how you don't lose mana until your heal is executed, I would assume the extra healing would be determined and applied at that moment (same time it calculates the amount healed based on your stats). Makes the most sense but then again I could be wrong as I don't know what gets priority. I think the confusion on this mace is that its NOT + or "up to" 953 healing when your target is below 50%. It's "up to" 486 plus 180 to 220 extra. The extra healing is not "up to" 180-220 and is a set amount received, making this far better than some may realize. This item drops from Archimonde and not Illidan according to WoR. Drops from Archimonde from mount hyjal on a test server i belive. This is a drop from Archimonde, the final boss of Hyjal Summit. This is from Archimonde (according to MMO-Champion site), and if so, why would a boss drop two healing weapons? Besides, Karabor is the old name of the temple where Illidan resides, so I'd say this is his drop and not Archimonde's . you are confusing 2 different weapons, this mace does infact drop from Illidan as it dropped for Last Resort. its exactly the same thing...? Mace also droped for Curse from Illidan NOT Archimonde. Do any theorycrafters or better yet anyone with experience with this item know if the special effect will apply to Chain Heal's second and third target? My **assumption** is that if the primary target of the CH is below 50%, then it will be healed for ~200 extra. The second and third target will receive 50% and 25% of what the Primary target was healed for respectively, but the +~200 healing is considered only to the Primary target. Lower healing ranks would massively benefit from the effect, though if the target is already below 50%, it might be smarter to cast a Holy Light anyway, for a Paladin. It's actually quite amazing for CoH priest. Melee classes usually oneshot to below 50% if boss has any kind of cleave,stomp,aoe,etc. But yet again I think this should go for paladins since priests have their t5 staff. Heal your target for 180 to 220. From the appearence of the proc, it would seem that the proc essentially casts another healing spell on your target (which heals for 180 to 220), and does not modify the spell which was cast. Since the proc creates an independent effect, it would only apply to the primary target (because the 180 to 220 is acctually another spell, and shares none of the properties of the original spell, and thus will not jump to other targets like Chain Heal does). Yes the proc will heal the target for 180-220 as an extra heal, but only if the target is below 50% after! your direct heal. I have this mace on my shaman and yes, it will proc on all 3 heals from a chain heal. It is very good for a shaman, because even if I'm at 0 mana I can still do alot of healing, just by spamming rank1 Healing wave (500healing/sec with 3/3 Healing way + 180-220healing/sec from proc). It's not something you need very often, but it helped me a few times in arena and on RoS (phase2). The extra +healing only applies if your target is below 50% AFTER your direct heal. The graphics will be changed slightly in Patch 2.2. The mace proc now works if your target receives the heal and he is lower then 50 %. It doesn't matter if he ends up with +50% hp after. The mace is insane for PvP Shamans because when your hp goes below 50 % the proc will work on each Earthshield tick and Natures guardian proc. Furthermore it also works on prayer of mending. I did not test it with lifebloom yet, but I am pretty sure it also works. Anyone have a suggestion of a really good off-hand to go with this? THE WORLD WILL NEVER KNOW!!! 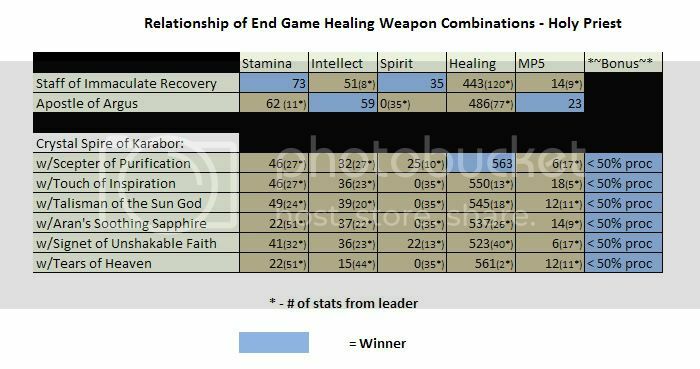 Here's a chart of end game healing weapon combinations for Holy priests. IMO, Apostle of Argus is slightly better than this for a priest. If you want to have massive +healing, go for spire/scepter combo. The 17mp5 you lose is partially made up in the 25 spirit you gain, plus the proc obviously. Both are very good choices. Does proc work on lifebloom tick or final heal, on rejuv/regrowth tick, or only for swiftmend. Im using apostle of argus, maybe this mace is better. Because it hasn't been stated before the Mace proc can crit and it's crit chance is based of your Healing Spell Critical chance. So for a Paladin as an example the proc should crit a fair amount. "Because it hasn't been stated before the Mace proc can crit and it's crit chance is based of your Healing Spell Critical chance"
Same as all other procs dealing a certain amount of damage or heal. This mace would be amazing for Circle of Healing on bossfights where it's massive aoe damage. Giving additional 200 on each hit is amazing, equals like 1000 +healing on CoH if all is below 50%. This mace was made with Shamans and CoH Priest in mind imo - absolutely insane with those spells. For a Tree druid it is bad because you mainly use hots then direct heals.Unless it works on swiftmend and/or lifebloom. In response to Druid's Lifebloom, this spell does not count for a direct healing spell. It is your targets heal not yours. If you look at your combat log it will read 'Tanks Lifebloom heals Tank for X' NOT 'Healers Lifebloom heals Tank for X'. It is sort of a dumb system in my opinion, however it remains. It goes great whit Scepter of Purification http://www.wowhead.com/?item=30911 or Touch of Inspiration http://www.wowhead.com/?item=32350 and T6 if you're a priest. spirit or mp5 for priest? iunno. choice is betwwen lights justice n crystal spire or karabor. Strikes me that this weapon provides the most benefit in the hands of a shaman (who can proc it multiple times with chain heal or on any one target with any of their heals) or a paladin (only has direct heals, and is generally put on tank healing...in a fight like Brutallus, every little bit helps). I would rate it slightly less spectacular for a priest, insomuch as renew and prayer of mending will not proc it. I would not recommend it at all for a tree druid, and not really even for a dreamstater. HoTs won't proc it, and the Dreamstate druid spams such a slow heal, their target is more likely to end up healed by someone else and bumped over the 50% requirement. In addition, many staves are well itemized for priests and druids, while most shamans and all paladins are restricted to mace usage. Those of you who are saying the equip effect does NOT proc on Prayer of Mending are wrong. The proc on this CAN proc on Nature's Guardian and Earth Shield if it is casted on yourself. Proc is worth +46 heal to shaman in our guild on sunwell raids. But that +46heal probably doesn't suffer from overheal. The heal does come almost 1 second later so it could still be overheal, just not very likely. With that in mind, since our shaman also do about 20% to 30% overheal, the proc's +46 is more like +61heal for theoretical comparisons. 2) The procc gets a small amount of your +heal on it. Would be nice if anyone was able to find the precise number, since its hard to do tests but ive noticed that it heals for more noncrit than the max value it says to heal for. possibly 1-5%. No, he meant Nature's Guardian. Pleassseee stop referring the +healing gained when your target is below 50% a proc. this is not the case. proc stands for: Programmed Random OCcurrence. there is nothing random about your target getting healed for more when he is below 50% while using this mace. aka. It is a proc. Purely curiosity, and highly unlikely, but can this proc off of Lifeward? What is enchant for aura ? What about on screenshot number 2, what kind of shoulder pads are those? They look EPIC! I won the roll for this and hearthed out, only to realize that it didn't automatically go into my bags and I apparently should have looted it manually. Ugh, even thinking about that still makes me want to kill myself. Have it for transmog on my Shaman..
Cant be used for mog this patch unless there will be a hotfix soon. Trying to mog a main hand healing mace with this and it only allows me to place it on my shield box for mog. Ofc trying to do that will give you the error: "you can only mog items of the same type and slot". Equip: If your target is below 50% health, your direct healing spells will cause your target to be healed for an additional 15 health.